The next batch of timetables changes for Plymouth Citybus are now available on line and dont make happy reading. Citybus have been slowly cutting back their Saltash presence. These changes cut back even more. This service is to be withdrawn from Saltash (for alternative services to Saltash please see the new Service 43A) and will operate in Barne Barton instead. The service will operate between the City and Barne Barton via Devonport every 10 minutes during the day from Monday to Saturday. Monday to Saturday evening services and Sundays / Bank Holidays daytime services will operate every 30 minutes. The service will start in Barne Barton operating as per the route of the current Service 43A. On reaching St Budeaux Square the service will then operate to the city centre as per the current Service 26 route. This change will see Plymouth Citybus significantly increase its level of service to Barne Barton from every 30 minutes Monday to Saturday during the day to every 10 minutes Monday to Saturday as well as every 30 minutes on Sundays and during the evenings from Monday to Saturday. Following the withdrawal of support funding the 06:45 Service 28B from the city centre to Derriford Hospital is to be withdrawn. The 08:15 Service 28B that operated to Crownhill will instead operate to Derriford Hospital as a Service 28A. The 08:15 Service 28B that operated to Derriford Hospital will instead operate as a Service 28 to Derriford Hospital. This service will operate every 30 minutes departing from the City Centre as per current times. However, the service has been facing increasing pressure in recent years especially in and around Transit Way and as a result struggles to maintain time especially during busy times. In order to improve reliability services to Derriford Hospital will no longer operate to Crownhill Village instead they will operate direct onto Tavistock Road via Budshead Way. To reflect the increased traffic flows especially around Transit Way inbound services will have an additional 5 minutes journey time and are being scheduled to arrive 5 minutes later than current times. It is hoped that the planned improvement works in Transit Way along with the success of the new bus priority in and around Derriford Hospital will see outbound services return to Crownhill Village in the not too distant future. This service is to operate every 10 minutes for most of the day from Monday to Saturday, every 30 minutes evenings and every 20 minutes during the day on Sundays and Bank Holidays. There is no change in route but the service is being retimed to improve reliability with services being adjusted in frequency to provide services every 10 minutes for most of the day with timings adjusted to create a bus every 5 minutes between St Budeaux and the City Centre for most of the day Monday to Saturday and in excess of every 20 minutes Sundays and Bank Holidays. This service is being withdrawn from Barne Barton and will instead operate to Pillmere, Saltash (for alternative services to Barne Barton please see the new Service 26). The service will operate every 30 minutes from Monday to Saturday between Pilmere, Saltash and the City Centre via Latchbrook, Callington Road, Saltash Fore Street, St Budeaux and Milehouse. 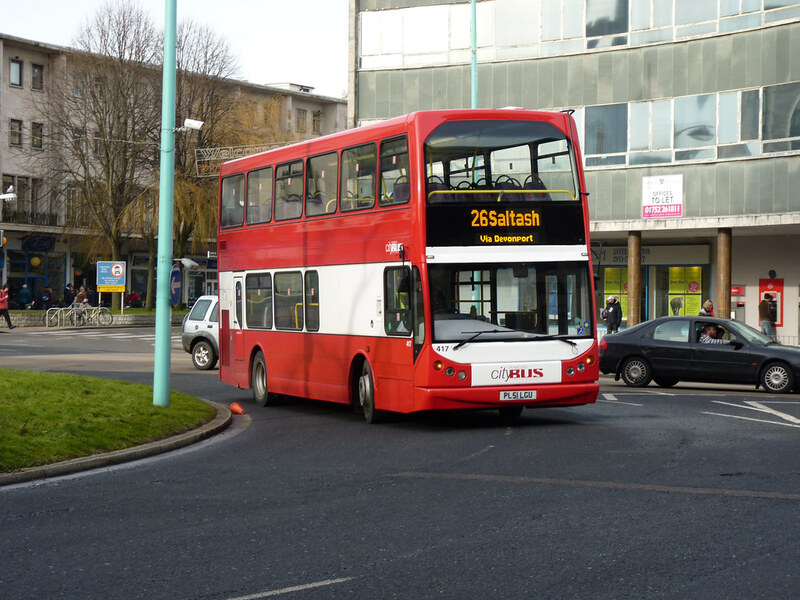 This change does see the frequency of Plymouth Citybus services into Saltash reduced from every 20 to every 30 minutes however by operating via Milehouse it represents significant journey time improvements. Sunday and Bank Holiday Services are to be withdrawn from Saltash. This service will operate every 30 minutes as per the current timetable with the only real change being that services from Holly Park to the City Centre will be scheduled to arrive 5 minutes later than the current times. Services 43, 43A, 43B and the Service 29 are being scheduled to provide services every 5 minutes between St Budeaux and the City Centre for most of the day from Monday to Saturday and in excess of every 20 minutes on Sundays and Bank Holidays. This service will operate between the City Centre and Cattedown every 30 minutes for most of the day with returning Cattedown services operating via Mayflower Street to the city centre. The Devonport section of this service is to be withdrawn (for alternative services to Devonport please see new Service 46 and 47). This service will operate every 30 minutes for most of the day from Monday to Saturday operating from the city centre to Stoke Village via Molesworth Road to Albert Road then as per the current Service 46 to Kings Tamerton via Fleetmoor Road. The service will then operate as per the current route of the Service 46 to the city centre with the exception being that the service will no longer service the Tamar Science Park. Services 46A, 146, 246 will either be replaced by the Service 46 or be withdrawn. Evening Service 46 will be withdrawn with Service 46A to West Park replaced with a Service 26B. This service will operate every 30 minutes for most of the day from Monday to Saturday from the city centre to Compton via Mutley Plain then Leigham, Estover and Derriford Hospital. The service will then operate as per the current Service 47 to Kings Tamerton before operating via Saltash Road, Stoke Village and Molesworth Road to the city centre. Services 47A, 47D, 147, 247 will either be replaced by the Service 47 or be withdrawn. Evening Service 47 will be withdrawn with the Service 47A from West Park being replaced with a Service 26B. This service has been facing increasing pressure and as a result struggles to maintain time especially during busy times. Therefore to improve the overall reliability of the service it is to be withdrawn from Keswick Crescent (for alternative services to Keswick Crescent please see the new service 46 and 47). The successful delivery of the Gydnia Way road improvement scheme together with improved residential parking may see the service return in the not too distant future. The review took into account customer feedback from our customer consultation exercise which took place in February 2010, market trends and the extensive changes in road traffic levels in recent years. I also get the feeling that they were also looking at the current First Ugobus timetables as some of these changes (and the recent Plympton changes) do seem to copy the Ugobus services and increase competition with First. The loss of the 50 into Keswick Crescent will also upset a lot of people as it gives a lot of passengers a long walk up a steep hill. I am sure its no coincidence that First Ugobus 15 also cuts across the top of Keswick Crescent. Its a shame that First fares are so much higher than Citybus as I am sure they would otherwise provide much stronger competition for passengers. I will be taking a closer look at some of these routes later in the month, when hopefully I will be able to update my maps as this is proving impossible on my current PC. In the mean time it will be interesting to see how passengers react to these changes!